Jackson's Sword is the initial volume in a monumental two-volume work that provides a sweeping panoramic view of the U.S. Army and its officer corps from the War of 1812 to the War with Mexico, the first such study in more than forty years. Watson's chronicle shows how the officer corps played a crucial role in stabilizing the frontiers of a rapidly expanding nation, while gradually moving away from military adventurism toward a professionalism subordinate to civilian authority. 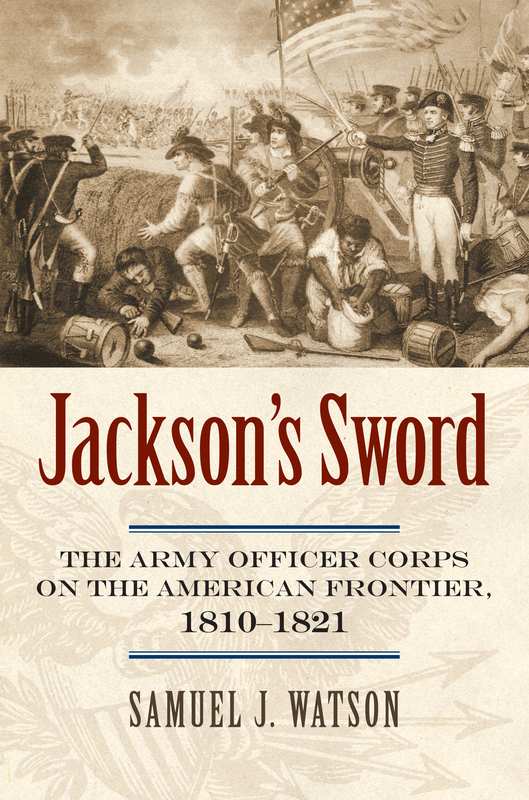 Jackson's Sword explores problems of institutional instability, multiple loyalties, and insubordination as it demonstrates how the officer corps often undermined-and sometimes supplanted-civilian authority with regard to war-making and diplomacy on the frontier. Watson shows that army officers were often motivated by regionalism and sectionalism, as well as antagonism toward Indians, Spaniards, and Britons. The resulting belligerence incited them to invade Spanish Florida and Texas without authorization and to pursue military solutions to complex intercultural and international dilemmas. Watson focuses on the years when Andrew Jackson led the Division of the South—often contrary to orders from his civilian superiors—examining his decade-long quasi-war with Spaniards and Indians along the northern border of Florida. Watson explores differences between army attitudes toward the Texas and Florida borders to explain why Spain ceded Florida but not Texas to the United States. He then examines the army's shift to the western frontier of white settlement by focusing on expeditions to advance U.S. power up the Missouri River and drive British influence from the Louisiana Purchase. More than merely recounting campaigns and operations, Watson explores civil-military relations, officer socialization, commissioning, resignations, and assignments, and sets these in the context of social, political, economic, technological, military, and cultural changes during the early republic and the Age of Jackson. He portrays officers as identifying with frontiersmen and southern farmers and lacking respect for civilian authority and constitutional processes—but having little sympathy for civilian adventurers-and delves deeply into primary sources that reveal what they thought, wrote, and did on the frontier. As Watson shows, the army's work in the borderlands underscored divisions within as well as between nations. Jackson's Sword captures an era on the eve of military professionalism to shed new light on the military's role in the early republic. Samuel J. Watson is professor of history at the U.S. Military Academy and editor of The International Library of Essays in Military History: Warfare in the USA, 1783-1861.